The company challenge gamification framework is an employee-facing model that’s designed to increase productivity through friendly competition. This gamified framework adds a layer of competition on repetitive or prescriptive gameplay tasks — mopping floors, entering data, and the like. This layer of competition takes the form of teams, allowing different groups within the organization to compete against each other. With company challenge, the daily grind becomes a game played across departments and locations. This competition not only motivates employees and increases productivity, but it makes work more fun than Joan Rivers at a theme park. Teams compete for accuracy, efficiency, and thoroughness. Leaderboards, standings, and comparisons bring out the competitive spirit and improve teamwork. Teams diffuse the individual pressures associated with gamified competition. 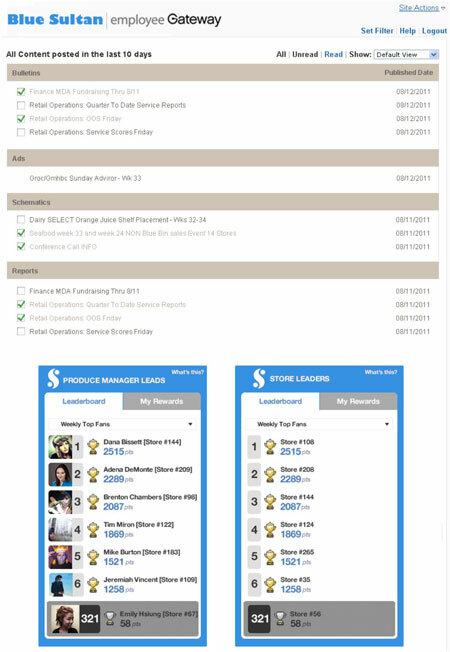 Visualizing progress: Levels, points, leaderboards, achievements, and badges provide users with gameplay feedback on where they are and how to levelup. The visual aspect is key to keeping employees performing. Rewards: Team and individual rewards can set employee behaviors. Teamwork: When teams win, players feel the victory, but team defeat doesn’t hurt as badly as individual defeat. Loss is spread out over the team. This gamification framework relies heavily on task-based missions and tracks, which help keep employees focused and on target during their work. 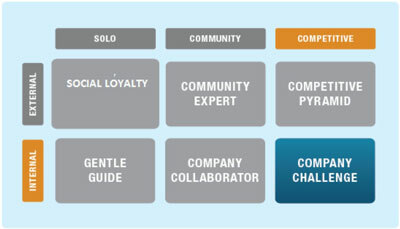 The company challenge gamified framework expands on individual gameplay tasks by dividing employees into teams. Suddenly, employees are no longer simply completing their work for rewards; they’re playing a game against each other. For example, now it’s the morning shift in a Pink Tangerine yogurt shop against the evening shift. Or it could be this Pink Tangerine outlet against the one across town, or against all the Pink Tangerines in the region — or even all the Pink Tangerines in the nation. Teams are a most excellent mechanic. They almost never go wrong. Clearly measured metrics — that is, points, leaderboards (both team and individual), levels, and so on — provide actionable gameplay feedback. Through these metrics, employees know what they’ve achieved. This visualization of status is instrumental in keeping employees performing at their peak. And of course rewards are important, whether driven by monetary incentives, privileges, or recognition. You can issue rewards on both an individual basis and a team basis. The company challenge framework doesn’t really lend itself to use in one industry more than another. Rather, company challenge is geared for organizations that want to improve productivity — especially for employees whose tasks are somewhat repetitive or prescriptive. Sales productivity: You could increase sales productivity by adding the company challenge gamification framework to your CRM systems. This framework allows you to create an additional layer of competition for sales and marketing team members. As members of your sales team compete, their efficiency and revenues will likely increase. Team performance management: The company challenge framework is ideal in large corporations where teams have specific metrics against which their success is measured. In these settings, this gamified framework effectively increases productivity and promotes corporate-wide teamwork with friendly gameplay competition. Support/call center operations: This gamification framework works well in support and help-desk systems. In these cases, you might create a layer of competition for support ticketing systems, with employees and teams who successfully close the most tickets declared the winners. Human resources: In this case, you might gamify the process of hiring employees, with the team that hires the most qualified candidates in a quarter being recognized. Claims processing: Consider a company that processes insurance claims. Teams that process the most claims in a quarter might receive a financial bonus or some free stuff. Nonprofit: Suppose you’re trying to get people to raise money for a certain cause. You can organize them into teams and reward them for performing such key tasks as making calls, sending letters, or raising the most money. Really, any organization whose employees are already arranged in teams with specific metrics that measure their success is an excellent candidate for the company challenge gamification framework. In these settings, this framework effectively increases productivity and promotes company-wide teamwork with friendly gameplay competition.